LED, fluorescent, and compact fluorescent lamps (CFL) are some of many lighting technologies that are available today. 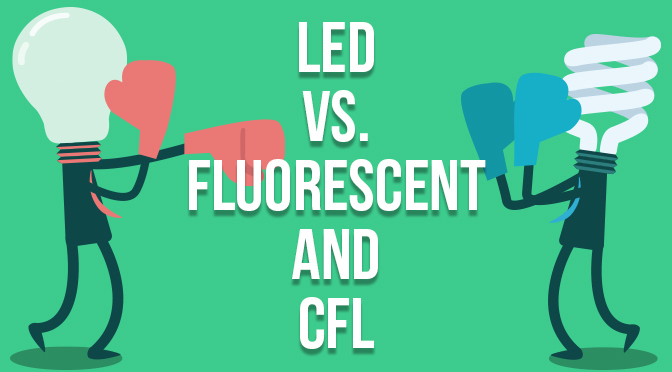 Knowing the difference between CFL and LED and the difference between fluorescent and LED can help you make an educated decision on what’s best for your application and budget. An electric current passes through argon and mercury vapor, which creates ultraviolet light that activates a phosphor coating on the inside of the bulb and causes it to glow or fluoresce—hence the term fluorescent. CFLs are fluorescent tubes that are coiled into a spiral shape so that they can fit the same applications as incandescent bulbs. CFLs and fluorescent fixtures may not operate correctly in high or low temperatures. They produce a considerable amount of ultraviolet (UV) and infrared (IR) radiation that can be damaging to fabric and artwork. Fluorescent bulbs and CFLs last about 10,000 hours—eight times longer than incandescent bulbs, but their life spans are five times shorter than LED lights. 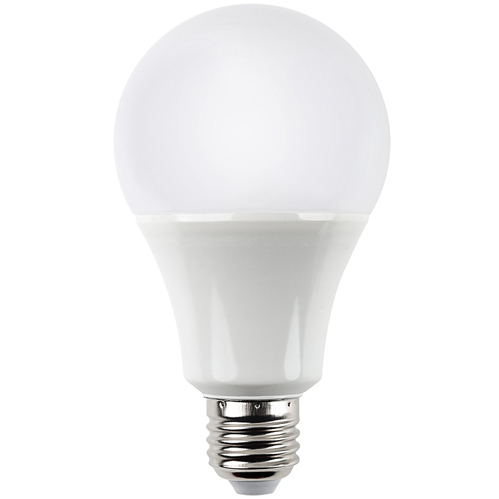 They consume 20 percent more power than LEDs but 75 percent less than incandescent bulbs. 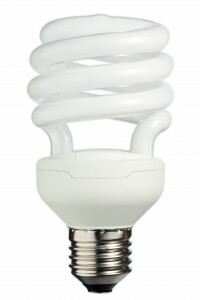 Fluorescent bulbs and CFLs are fragile and contain mercury. If they are broken, special precautions must be taken. Among other steps, ENERGY STAR recommends airing out the room, sealing bulb contents, and turning off any heat or air-conditioning systems. They can take up to three minutes to reach full brightness. Because they need time to warm up, powering CFLs and fluorescent fixtures on and off quickly can lead to reduced life spans. They have a low color-rendering index (CRI) and produce an unflattering yellow-green hue. 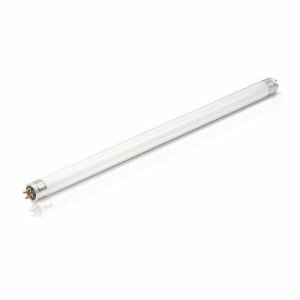 Fluorescent bulbs contain ballasts that, unless are integrated (like in screw-base CFLs), often fail and need to be replaced. LEDs produce the longest-lasting, most energy-efficient lighting available today. A semiconductor rich in electrons and a semiconductor rich in holes are used to create an LED. Passing a current through the junction of these two materials combines the electrons with the holes and produces photons, which is the light that you see. LED lights have endless application possibilities, such as under-cabinet, landscape, vehicle, home, industrial, and commercial lighting. LEDs run much cooler than fluorescent bulbs and don’t require high running temperatures to work properly, which greatly increases their longevity and enables them to function in cold temperatures. Unless an LED light is specifically infrared (IR) or ultraviolet (UV), it produces little to no IR or UV radiation that can be damaging to fabric and artwork. They can last up to 50,000 hours—five times longer than CFLs. 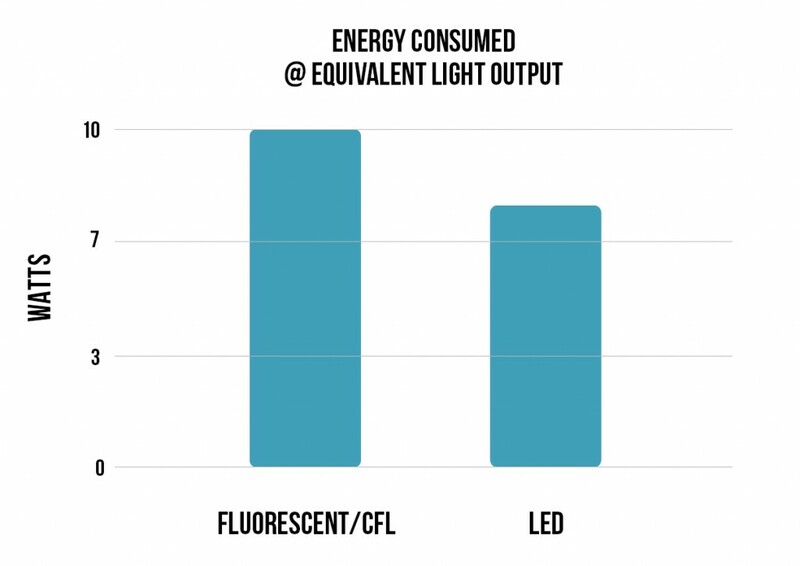 Power consumption is the lowest compared to all other lighting technologies—20 percent less than fluorescent bulbs. LED lights contain no mercury, harmful gasses, or toxins. Many of these bulbs are shatterproof and shock resistant. They illuminate instantly unlike fluorescent bulbs and CFLs that can take several minutes to reach full brightness. LED lights require higher initial investment but are the best value due to energy savings and longer life spans. Because of their low power consumption, LED lights are great alternative lighting solutions for solar-powered systems. For technical questions, don’t hesitate to call us toll free at 866-590-3533. Our customer service and technical support teams are available from 8:30 a.m. to 8 p.m. CDT Monday-Thursday and 8:30 a.m. to 4 p.m. CDT on Friday. Am I correct that trying to convert my 2008 Toyota Highlander stock headlights to LED requires mechanical know how? How expensive is it and are there records maintained about how long the LED’s would last? The cost is just the cost of the lamps themselves, however a soldering iron is required.